In just 18 short days, the young protesters in Cairo's Tahrir Square upended global politics. Not even three weeks after the peaceful demonstrations began, not even two weeks after pro-government thugs charged into the square on camels and horses to force them out, one of the most entrenched leaders in the Middle East and a longtime U.S. ally, Hosni Mubarak, was gone—and autocratic leaders from Morocco to Bahrain were feeling the heat. Who: Our contributors include Issandr El Amrani, Karim Sadjadpour, Marc Lynch, Toby C. Jones, Ellen Knickmeyer, David Kenner, Christopher Alexander, Michael Koplow, Tom Malinowski, Steven Heydemann, Eric Goldstein, Ashraf Khalil, Amil Khan, Blake Hounshell, Peter Bouckaert, Tina Rosenberg, Maryam Ishani, Hugh Miles, James Traub, Robert D. Kaplan, Gary Sick, Elliott Abrams, Zalmay Khalilzad, Stephen Sestanovich, Aaron David Miller, Stephen M. Walt, Nathan J. Brown, Mohammed Ayoob, and David A. Bell. PLUS: New introduction and updated coverage with the latest from the region. 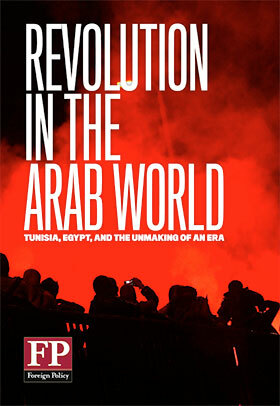 What: This special report from Foreign Policy offers 217 pages of news, views, and insight into the dramatic events unfolding in the Arab world, with chapters ranging from the experts who caught the first signs of the conflagration to the on-the-ground tick-tock from Tahrir Square. Check out the table of contents for more details.